Have you ever wondered what would happen if someone made a “Pokemon like” Role Playing Game (RPG)? Well I hadn’t until I heard about Late Knight Games (LKG) MajiMonsters. And now I want to play! But enough about what I want in life. Let’s see what Elly’s friends at LKG had to say about creating a successful RPG and self publishing it through Kickstarter. (DAN) A good place to start is our website. But our product MajiMonsters and all supplemental content is only available for sale via DriveThruRPG. You can also find us on Facebook or Twitter. Funds for this product were raised on Kickstarter which you can reference here if you’d like as well. (DAN) Late Knight Games, LLC. The company is made up of the five of us: Dan, James, Jon, Sandi, and Stew. (Sandi) We all live on the east coast, near enough to each other to have regular meetings. Though we hold a lot of them using Google Hangouts to keep in touch and check in with our progress. (Jon) We’re spread between Pennsylvania and Maryland, about a 4 hour radius for driving distances. 1. When and why did you start playing games? (DAN) The five of us actually became friends through a role-playing games club in college. It was fitting that years later we’d come together to make one of these games we bonded over playing. (Sandi) I started the club (called SGS, or the Simulation Gaming Society) at York College of Pennsylvania. We played a lot of Magic, D&D, and had board game tournaments. But I’d have to echo what Dan said–at that time, I didn’t think then that we’d ever embark on any sort of serious collaborative project like this. We were just there to have fun. But we stayed in touch way after graduation to game and do fun events. (James) I still remember Sandi managing to hunt us down one by one for the club. Kind of unnerving now that I think about it. . .
(Jon) I started playing Uno with my grandma early on, maybe 6 or 7. Graduated to Magic the Gathering in middle school and was always interested in role-playing games. Sandi recruited me to play D&D the first week in college and the rest is history. (Stew) I started playing MTG in the 7th grade, and dabbled in D&D in early high school because my older brother played. It wasn’t until I met the SGS group did my true gamer nerd appear. 2. What is the name of the first game you have published? 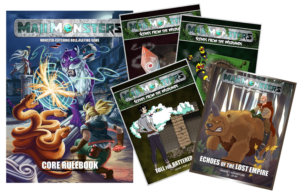 (DAN) MajiMonsters – A monster-catching tabletop role-playing game. It’s like a D&D / Pokemon lovechild. 3. When was the first time you remember wanting to create a game of your own? (DAN) I’ve been creating games since I was in grade school, but I never had any ambition towards publishing them. I was actually very reluctant to move forward with MajiMonsters at the game’s inception–Jon basically strong-armed me into it and I’m glad he did. Once the five of us decided we we’re doing it, we were all in for the long haul. (James) I think we were all a little hesitant at first, except for Jon. There were more than a few times I thought we were in way over our heads. I totally talked most of the group into putting MajiMonsters up on Kickstarter. Turns out, fairly hard. Well, not hard so much as time consuming. It was totally a labor of love though, it was just a matter of finding time in between our full time jobs and family obligations. (Stew) For a long time I’ve wanted to be able to make video games, but that requires a lot of skills I don’t possess. When Jon kept saying “it would work if we were playing Majimonsters.” I think it kind of clicked with is that maybe we should actually make this thing. 4. What steps did you take in planning out your game? (DAN) Before MajiMonsters was MajiMonsters, it was a Pokemon RPG because the world needed one that wasn’t a reskin of 3rd Edition D&D. That game existed for two years of us playing privately before we decided we had a product we wanted to share. Of course, that meant making new Monsters and a significant retooling of mechanics, although these turned out to be a very fun and rewarding part of the process. Once we had MajiMonsters in a place we were comfortable with, we took our idea to Kickstarter to raise funds. A quick summation of 2+ years since funding, and a lot of things overlapped each other. (Jon) Before we started our Kickstarter campaign, I tried to do as much research as I could. 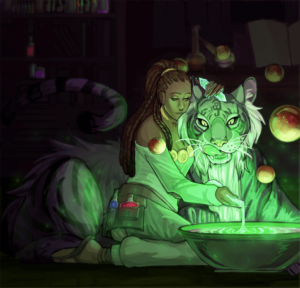 I read a lot of articles about running successful crowdfunding projects, and I contacted a few creators who had made independent RPGs on Kickstarter for advice. I searched around for blogs and podcasts where we could spread the word. 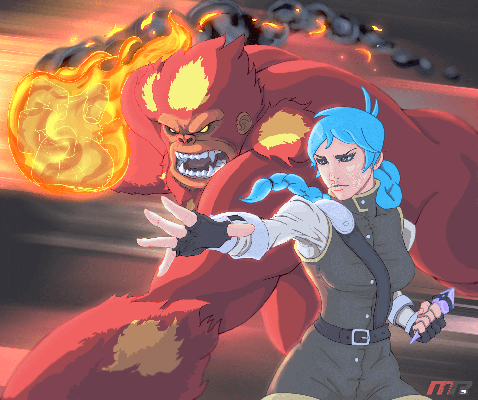 I contacted artists I found online that would be interested in doing artwork for a project like ours. It was a lot of emailing. 5. Was it difficult finding playtesters? How did you find them? (DAN) All of our Kickstarter backers were invited to playtest, and we had run the game privately among ourselves for years, developing it each time. We invited playtesters to give us feedback which led to plenty of changes to the game. (Jon) We also attended Gen Con and other small gaming cons and ran demo games to do a bit of playtesting. Those were good for seeing how someone who had never heard of the game before would view it after an initial play through. After a session or two of combat, I’d ask all the players if they had any notes, sometimes people would have really good suggestions. 6. How did you publish your game and what was most challenging about this process? (DAN) We funded with Kickstarter and was it ever a nailbiter. We didn’t hit our $12,000 goal until two days before the campaign closed… we were pretty stressed up to that point. I think the biggest challenge was that we underestimated how long it would take us to do a public playtest and actually create the game based off feedback. We had estimated a year, but in reality it took us 18 months. (Jon) If you crowdfund a game like us, you’re initially relieved when you raise the money but that’s only the beginning. Once you start putting everything together you realize just how much stuff you as a game designer have in your head and never bothered to actually write down. While we were playtesting the Pokemon version, we had a rulebook, but whenever we changed a rule or something, it would often just be written in the margin, or on a character sheet, or just in our general memory. Actually writing the final book and consolidating every single rule for everything in the game presented several challenges. Especially when two people had different understandings of a rule or there was no rule for something we hadn’t yet considered until it came up as a hole in the rulebook. We would have in person meetings every month to argue about semantics and specifics of rules or wordings of passages. 7. What obstacles did you overcome in the manufacturing process? (DAN) There weren’t really many obstacles as I’d put it, but it was a learning process. We went through three proofs of the book before we committed to manufacturing, and we made a whole host of other products to accompany the rulebook as rewards: dice, pencils, tokens, even a GM screen for backers. Fortunately, we nailed our budget. A lot of Kickstarter newbies sink themselves with these kinds of add-ons and I was glad we could get them at the cost we anticipated. (Sandi) It’s a good idea to overestimate production costs because at a few points we weren’t sure if the cost for things like shipping and printing might go up. (Jon)Thanks to Dan’s excellent knowledge as a graphic designer he was able to fix the image and text problems with the proofs of the book fairly fast. The whole process of laying out a 300 page book was quite an undertaking though. We were also lucky that our publisher made most of the process easy, since they did such a nice job. 8. How long did it take you to create your first game from the planning to the publishing phase? (DAN) Development and initial playtesting of the system started in May of 2012… but MajiMonsters as what it is today didn’t truly begin until April of 2014, when we formed Late Knight Games. That’s when we got serious and planned everything out. So from there, a little more than 2 years would be fair to say. (Jon) The final push was about 2 years long. This was all while we were working other full time jobs, some of us more than one, some of us got married, changed jobs, bought houses, had kids, or got a doctorate during this time. It was a hell of a juggling act for us. The weekly online meetings helped a lot to keep us on track, especially during the last year. 9. Where did you promote your game? (DAN) Kickstarter and Facebook have been a good source of promotion while the game was in development. But now that it’s available for sales most of our promotions run through DriveThruRPG and its sister sites. (Sandi) Word of mouth matters as well. We’ve visited our alma mater and have run games at conventions so I think we get a lot of fans that way. (Jon) Dan and I also appeared on a few podcasts like Dice and Stuff, Go Fund This, and the GameEnthus podcast. Small audiences, but it was fun nonetheless. 10. What did you find to have worked best in promoting your game? (DAN) Pictures of the Monsters, pages from the sourcebook, and inviting viewers to engage in conversation usually drew the most hits. MajiMonsters is fairly niche so we have a good idea of the people looking into it and what their interests are. (Jon) People really do judge a book by its cover. So in our case having some awesome cover art to show around the internet did seem to help. 11. What are several things you wish you did differently when creating your first game? (DAN) I definitely would have run the Kickstarter differently. MajiMonsters was my first campaign and, while it was successful, I feel like I really learned so much since then I could do it better now. One thing I always recommend to new creators is to have your product as close to finished as possible before launching a Kickstarter campaign. We’re taking this philosophy with future MajiMonsters products. (Jon) Dan is totally correct. My motto is before you crowdfund do as much work as possible on your game, then do more work. I think we did about as good a job as we could spreading the word, but we have a few more avenues of exposure now that we didn’t back then. Building up a fanbase ahead of time is really great if you can do it, but it’s also one of the hardest things to do. 12. Why did you set out to create your first game? (DAN) I like the idea of having a finished product with our names on it. It’s one of my highest-held accomplishments and I have it as a constant reminder of the awesome friends I worked with to make it a reality. (Sandi) I’m in this because I love stories. I had never really thought of making my owngame but I’ve loved running role-playing games, being in them, and writing stories. The best role-playing game isn’t one story, but sets the stage so that players have both inspiration and endless potential for storytelling. It thrills me to know that we’ve made that possible. (James) We’ve often talked about creating our own games in the past so it was a thrill to be able to follow through. (Jon) Having something of our own that we can tweak and build on as we please is pretty cool. I often think about other peoples games we play and think how I’d do it slightly or even drastically different. Now that we have our own game, we can do whatever we want with the rules and it’s official. (Stew) I liked the idea of the challenge and being able to be on a team formed from friends with over a decade of friendship. 13. 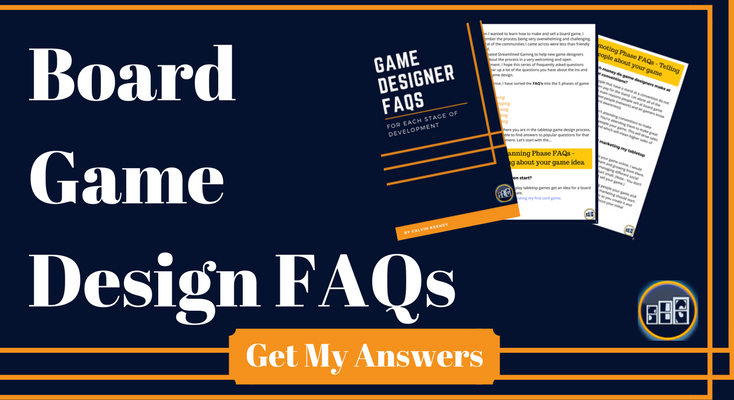 What is your favorite part of game design? (DAN) This has been a great team process. We split up duties and worked together to come up with descriptions and ideas for Monsters, classes, items, and everything that should be in a proper RPG – from magic relics to common barrels (you’ve gotta have the barrels!) Bouncing ideas off other team members and seeing those ideas take form is really gratifying. James writing stories, Stew telling us not to spend so much money, and it was hard to keep track of everything that needed to happen–but every so often, we’d see how it all looked for a moment, and that was a beautiful thing. Even now, wheels are turning and I really like going back to reinterpret our work and find possibilities for the future. (James) Creating monsters is by far one of the most satisfying parts of game design. As a monster-catching RPG, the monsters take center stage and are the main focus of the game. Without unique and interesting creatures we are doomed from the start. It is so cool to see the monsters come to life as their art and descriptions are completed. (Jon) My favorite part was definitely creating the character classes and figuring out ways to make them different from each other as well as coming up with lots of merits for players to earn so they can do cool stuff in game. I also like the power balancing aspects of the game. Like figuring out the point buy system for the monster stats, coming up with estimated damage tables for different levels. That kind of stuff. Even little stuff like how dice and bonuses would work. We tried out a lot of different ways to use the dice before we settled on our current system, and I love rolling dice! (Stew) I liked the playtesting and seeing what worked and what didn’t work. I’m not the most creative type, so coming up with monster ideas was rough and forget about story elements. I think I still have homework on a story I was supposed to write. (DAN) I can confirm this. 14. What is your least favorite part of game design? (DAN) We playtested a lot for good reason. And we suffered from a few internal disputes over how to best handle player feedback from the playtests. MajiMonsters is strong as a result of playtesting, but let’s just say I’m very happy we’re past the arguments that arose from it. (James) The arguments weren’t that bad, right Sandi? (Sandi) I had a nightmare about you and Stew leading a group of MajiMonsters to my house to attack me after one of our arguments. (Stew) The arguments would get frustrating, especially when the same topic kept coming up. I think in the end, it gave us a stronger product and a better friendship so there’s at least a silver lining. (Jon) Arguing over sometimes even the smallest aspects of the game was probably the worst part but it still needed to be done and I’m glad we forced our way through it. My least favorite part of arguing about a final ruling or decision was when I didn’t like any possibilities on the table. But I couldn’t think of a better solution to suggest. (DAN) To build on this, I always said I’m glad we could have arguments about MajiMonsters because it meant we were all passionate about the final product’s outcome. If we drifted along all agreeing with each-other we probably would have had something bland as a result. The few disagreements were, ultimately, what was best for the game. 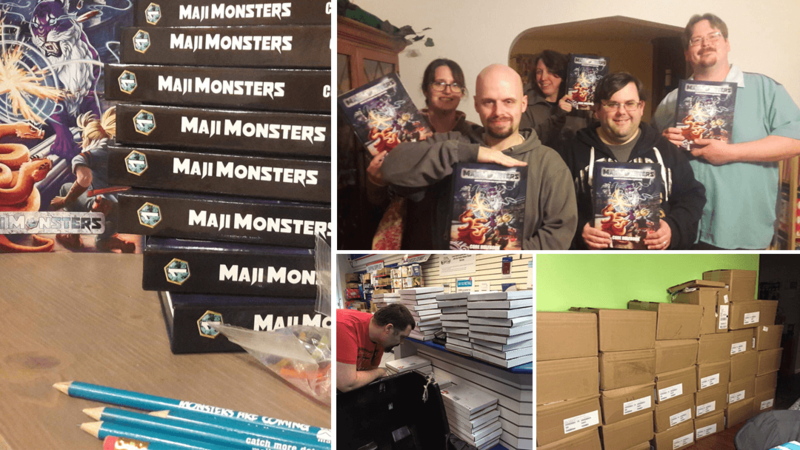 (DAN) Even though we’ve finished the core rulebook for MajiMonsters, we’ve been able to produce supplemental material on a monthly basis for the game… most of which is free. 2017 is looking like a fun year for MajiMonsters; we’re going to continue to make new adventures and content for the system and start to do the convention circuit with a finished product! (Jon) Our next big goal is to work on a major MajiMonster supplement during 2017, but this time we’re really trying to get it mostly done before crowdfunding. Until then, enjoy our little supplements if you can’t get enough MajiMonsters. Also most of the group will be in Indianapolis for the 50th Gen Con this August. We’ll be running lots of events if you want to come by and see the game. It was awesome to hear from you about MajiMonsters. We can’t wait to see what you come up with next! I would like to thank Elly for setting this interview up through her friend Sandi. And as always, if you have additional questions, leave them in the comments below. Want to see more Interviews? I agree! We should try it out as our second RPG. Danny can DM for us.